If your home is facing water damage, many items can be affected. Contact SERVPRO for an assessment and effective remediation services. When we work on a house in the Irwindale area, our specialists apply the knowledge and skills they gained through IICRC training. Much of this knowledge involves information that people usually never need. Because of this, we understand that many of our customers have questions about why we do certain things the way we do while working on their properties. One of the questions we hear from customers is why do SERVPRO specialists dispose of some items and not others during water damage mitigation in Irwindale. The answer is that we look at several factors on most items, and only a few on others. Some of your belongings become damaged almost immediately when they become saturated with water. These items include furniture pieces made of particle board, as well as flooring made of wood-based products. Other times we look at the amount of damage sustained. We compare this to the replacement costs for that item. Replacement costs also include the expense of installing the materials. When cleaning or refurbishing carries a lower price tag, we choose that option over replacing the materials. Wood floors made from real wood lumber can look like they did before the incident that threatened your home with water damage. SERVPRO technicians can undo the damage and save the floor from permanent damage and keep the customer from needing to replace a very costly item. Partially damaged structural components like drywall cost little compared to others but SERVPRO cuts costs wherever possible. Cutting above areas of a damaged wall means we must only replace the sections cut away. After removing the wet drywall, we can bring in new sections and cut them to size. SERVPRO of Irwindale / Baldwin Park knows how to keep costs down during water damage mitigation and still restore your property, so it looks "Like it never even happened." again. 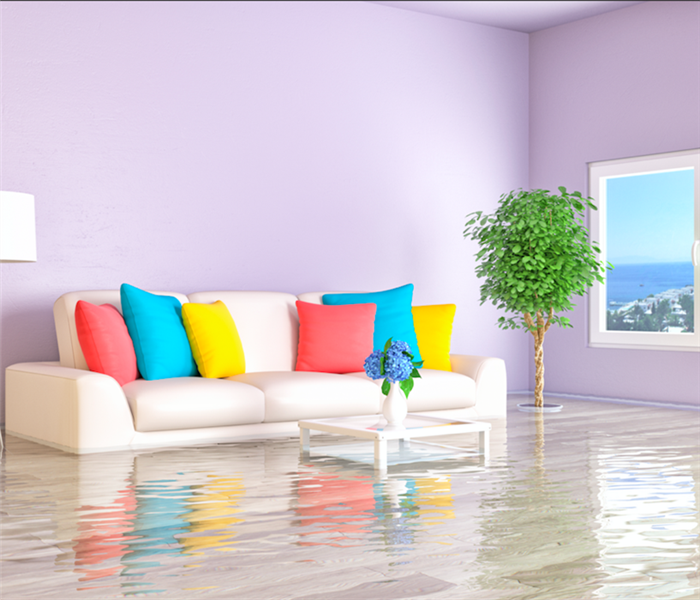 Call us at (626) 337-3374 to make sure your home is protected from water damage at a reasonable cost. Click here for more information about the city of Irwindale. Our team has the resources and expertise to minimize the disruption to your family after fire damage. We work as quickly and efficiently as possible. Dealing with a fire accident is stressful regardless of the size of the fire. Fires can cause considerable damage to your home. The fine, powdery smoke and soot particles can spread and settle on different surfaces. Smoke and soot can stain walls, flooring, furniture, and ceilings within hours because of their acidic nature. You may need to refinish severely damaged wood and repaint ceilings and walls. Personal possessions may become permanently damaged if not cleaned well. More severe damage may occur to your home due to prolonged exposure to smoke and soot. To restore your Irwindale home after fire damage, you can hire fire restoration professionals from SERVPRO. Our remediation experts can clear the affected areas of any debris, dry the wet areas, and restore salvageable items like valuable art. Here at SERVPRO, we know that restoring the damaged areas of a home is more cost-effective than demolishing and replacing them. Our “restore first” mentality enables us to get a building back to its preloss condition quicker. We use professional grade equipment to reduce claims loss expenses. We use ULV foggers to deodorize affected fabric, furniture and other materials that sustained smoke and soot damage. We also use air scrubbers and ozone machines to improve air quality after a fire. We can also use air duct cleaners to remove soot from air duct vents. After a fire, smoke first travels to places with a cooler temperature, meaning that the air ducts of your home can be filled with smoke. The smoke turns into soot after settling into the air ducts. We can inspect the air ducts of your home during the fire damage restoration process and clean them if they have soot. If water damage has occurred due to fire-fighting efforts, we can use industrial grade pumps to remove most of the water quickly. We then use air movers and dehumidifiers to remove the remaining water. Our technicians can also sanitize the area to prevent microbial growth. SERVPRO of Irwindale / Baldwin Park has the expertise and equipment to restore your property quickly after fire damage. We’re Faster to Any Size Disaster. Contact us 24/7 at (626) 337-3374 for assistance with fire restoration services in Irwindale, Baldwin Park, Vincent, and neighboring areas. The Irwindale recreation department offers various sports programs and activities for adults and youth click here for more information. When is the Right Time to Start Water Removal in Your Baldwin Park Home? Water leaks can quickly escalate and cause water damage to your kitchen. Contact our SERVPRO team to mitigate the situation. When your pipes break and send water gushing into your Baldwin Park home's kitchen, you need an immediate response. Depending on the diameter of the broken pipe's diameter, hundreds of gallons of water can submerge your floors in a very short period. You need a company who can fix the problem and protect your home. Saving homes from increased damage is why SERVPRO trains their employees to work together as teams, including when water removal in Baldwin Park becomes a necessity. Our ability to work together is enhanced by our ongoing training in the latest restoration methods, as well as refresher courses on more rarely needed techniques. This specialized knowledge keeps us always ready to serve our customers when they need mitigation services the most. Removing water with our truck-mounted pumps means we can drain off the water at the floor's level. The pumps we use can be submerged and suction off the water until the floor is once again visible. Removing water that sits in depressions in your floor with small-sized wands helps eliminate any water that became trapped like water does in the shallows at a beach. Mops and buckets help remove additional moisture, as do our air movers that work to lift water up and into the air so our desiccant machines can grab hold of the water vapor and trap it in its tank. The way we work helps protect your property from the development of more severe damage that takes place when water remains in contact with the interior of a home. Initial contact between water and your home's interior does little damage to many materials. However, when water remains present, the changes brought on by its presence snowball rapidly. Drywall turns soft and falls apart where saturated with other areas quickly showing signs of mold growth. Wood can also swell and warp, altering your home's structure. Calling SERVPRO as soon as possible can stop these things from happening and save your home from the majority of things that can go wrong. Click here for more information about Baldwin Park. Count on SERVPRO if you experience water damage in your building. A fire suppression line burst in the first floor under the concrete slab of a commercial building. SERVPRO of Irwindale/ Baldwin Park is called in to provide Emergency Services. Fire Suppression lines are high-pressure water lines intended to safeguard the building in the event of a fire. 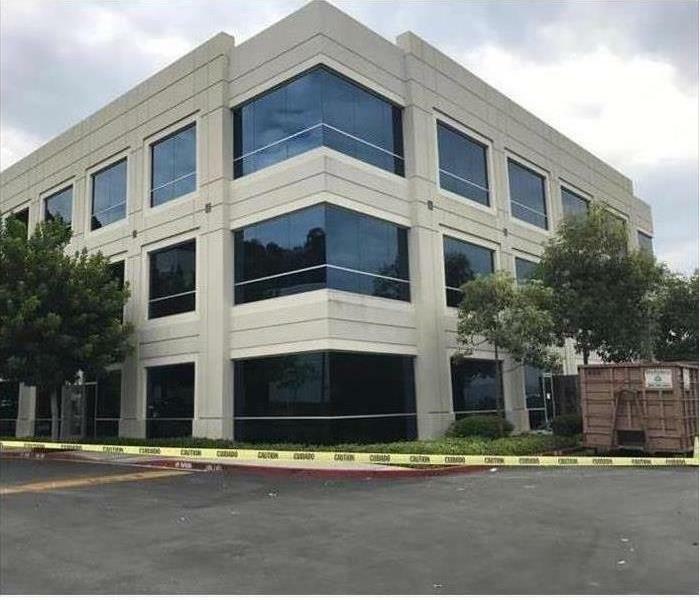 Occasionally, these lines can break and lead to large volumes of water being released quickly, causing significant water damage to the building in Irwindale. The rupture flooded the entire 1st floor, approximately 25,000 square feet. The first floor of the facility is a mix of offices and open cubicles, conference rooms, lobby, and kitchen/break room areas. The interior/exterior of the walls of the structure are steel framed and insulated. Standing water was found in the C-channels, and the insulation was saturated. Drywall was wet up to 24 inches throughout the facility. Upon arrival, 2-4 inches of standing water was present throughout the first floor. SERVPRO performed water extraction of the entire area, and necessary drying equipment set in place. SERVPRO of Irwindale/Baldwin Park has been a “Large Loss Response Team” serving the Los Angeles Basin for many years. This project will be expertly handled, keeping the time to get back to normal as short as possible and keeping the cost to recover as low as possible. See events in Irwindale, CA by clicking here. Many levels of water damage can affect your warehouse, and overcoming these potential hazards is something that trained professionals can handle. 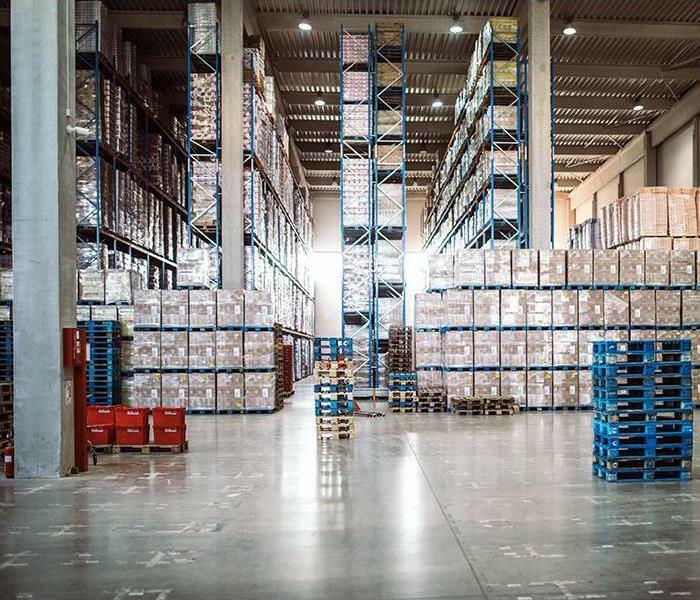 Warehouses serve the vital role of storing stock and distributing goods as a waypoint in the Baldwin Park area. While you have many responsibilities to uphold when overseeing a facility like this, the safety and security of the items within this building are often the priority. When water loss incidents occur on a large scale throughout your warehouse, it can quickly get out of control from what your custodial staff and employees can manage. Our professionals are available 24/7 to provide effective mitigation services designed to keep products and your facility safe amid a widespread water emergency. Many levels of water damage can affect your Baldwin Park warehouse, and overcoming each of these potential hazards is not something that untrained professionals can handle on their own. Our SERVPRO team goes through extensive training and ongoing education to be knowledgeable assets to our customers in the field, providing effective solutions and money-saving efficient practices. These approaches begin with our rapid response to the situation with the full measure of our restoration equipment and personnel. When we first arrive, assessing the damage is an important first step to take. During this process, our contents department can begin packing up affected and at-risk items for removal to our nearby facility. There they can get cleaned, dried, deodorized, and protected from secondary effects like mold growth. Once the building has gotten restored successfully, we can return the stock and removed contents back to where they belong. Extraction and drying follow the initial assessment of the damage and can showcase many of our finest pieces of equipment. Our SERVPRO technicians have many air movers and dehumidifiers at our disposal, allowing us to quickly dry very large areas simultaneously with the combination of these tools. You cannot account for the likelihood of a water loss incident, but you can depend on the team equipped to handle these situations and protect your investment. You can reach our SERVPRO of Irwindale / Baldwin Park rapid response team 24/7 at (626) 337-3374. Click here for more about Baldwin Park. This may look like an easy fix but it is not. Call SERVPRO today to help fix this fast and efficiently. A natural weather event can cause flooding to your property block resulting in angry tenants and, if not remedied quickly, legal challenges. As the landlord of a block of flats restoring the ground levels quickly can often go beyond the scope of your regular janitorial team, unusually where cinder blocks have prolonged exposure to standing water. Using a professional commercial restoration service can save you unnecessary expenses and keep your tenants happy. Apartment blocks with commercial flood damage in Baldwin Park rely on an immediate response unit to help limit losses in an emergency. Tenants can quickly become agitated by the shutting off of power or standing water inside the property. What makes life more difficult is that cinder blocks typically used in the construction of apartments have open cells that can quickly absorb moisture. SERVPRO is available 24 hours a day via our emergency call-line and can send an emergency response team to your property immediately upon receiving notification of loss. Our technicians set to work straight away removing hazards, creating a safe workspace for general contractors and restoring power. Wet cinder blocks can cause permanent damages especially during the winter months where the risk of water freezing and subsequently expanding, can require demolition if left unchecked. Using industrial drilling equipment and our extensive expertise, we can get air circulating into wall cavities while draining excess moisture from the cinder block. By using a nonpenetrating moisture meter, we can efficiently detect whether a wall cavity is completely dry or may need more advanced equipment to help reduce secondary damages. Taking this measurement can be the difference between sustaining permanent losses or restoring a building to its preloss conditions. In cases where cinder blocks are not sufficiently dry, we can use injectidry systems or other advanced pieces of equipment like desiccant dehumidifiers to get the job done. In a natural weather emergency, you need a service that can act fast, contact SERVPRO of Irwindale / Baldwin Park immediately at (626) 337-3374. Click here for me about Baldwin. Are You Making These Types of Commercial Flood Damage Remediation Mistakes in Baldwin Park? Water that comes into an area from a river that crested and overflowed its banks comes with much more force that water that comes out of a broken pipe. The water can push on foundations and affect the frames of buildings in Baldwin Park. The damage caused by such events bring many changes to properties located in the area, but SERVPRO is always ready to help make things normal again. 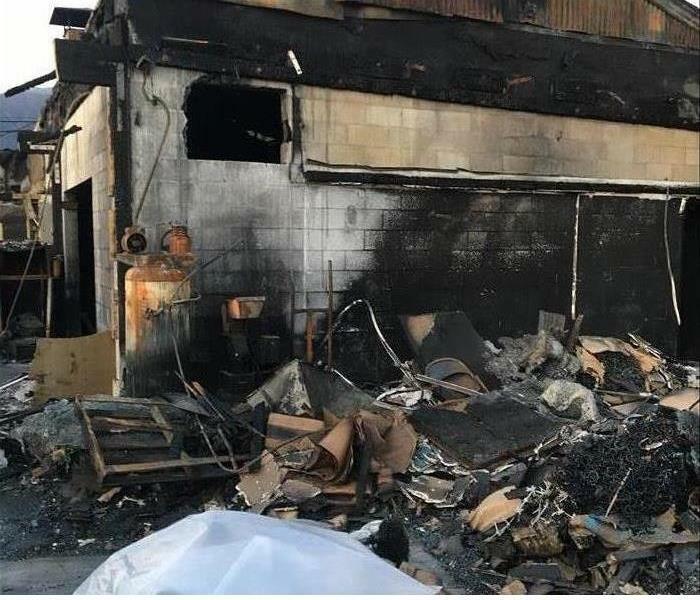 Shops need to reopen as quickly as possible after a catastrophe, but mitigating commercial flood damage in Baldwin Park requires more than a few fans and a mop. Our team of specialists can make things happen faster and more smoothly than relying on your employees. The work involved also carries substantial risks, including possible health effects. To achieve the best results possible involves expertise that requires extensive training and specialized equipment. SERVPRO teams arrive in our Green Fleet's vehicles, loaded with the supplies and machinery we use to mitigate buildings, save inventory, and prevent additional losses. Our specialists use pumps that can extract all of the water quickly from floors, allowing us to start the drying process. Removing saturated materials like walls and carpets opens up underlying areas to our air movers' currents. Heat also helps extra moisture from materials while raising the amount of water vapor that the air can hold. Removing water from trapped areas means that moisture evaporating later cannot affect your merchandise. The risk of such problems increases significantly with flooding over clean water from a lower-pressure source. The same force that can twist a framework can also push water into enclosed spaces that overflowed water cannot match. Because this water can contaminate your future merchandise, it is crucial that we remove it from wherever we locate it within your building's structure. Shoes and other footwear come in different materials that support microbial life. We use thermal imaging cameras and moisture detectors to find moisture hiding and at what amount. Protecting your shoe store and its inventory is why SERVPRO of Irwindale / Baldwin Park always answers our 24-hour service line. Call us at (626) 337-3374 to protect your Irwindale or Baldwin Park retail business from flood damage. Click here for more information about in Baldwin Park. 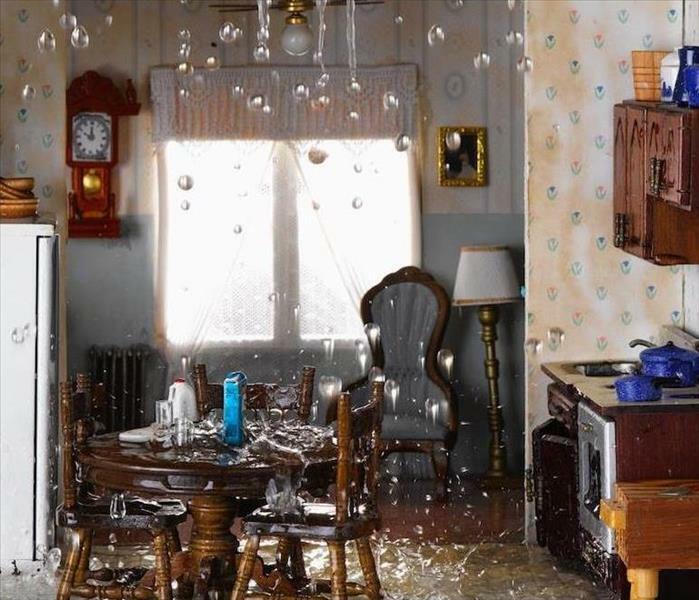 Don't Panic After A Water Damage Disaster In Your Irwindale Home, Call Our Experts At SERVPRO! You can reach us at (626) 337-3374 any time. If a pipe bursts and water leaks into your Irwindale home, you need to take immediate action because extended exposure to water or moisture causes untold problems in many structures. In most cases, the lack of resources or skills holds people back from taking the necessary steps leading to substantial repair costs. You can avoid such an outcome by involving a certified WRT, Water Restoration Technician, immediately you notice the problem. Responding within the first 24-48 hours helps guarantee a better outcome from the effort put into water removal in Irwindale because taking longer creates an opportunity for mold growth. At SERVPRO, we are always available to respond to your call since we have skeleton crews monitoring operations during off hours. Such immediate response makes a huge difference. Also, our highly trained technicians can also advise you on which steps to take before we arrive at your premises to minimize damage. Removing water from the property is a challenging prospect because you have to remove all traces including what may have spilled into concealed spaces such as wall cavities. Having the right equipment for detection and removal eases the burden. Our SERVPRO technicians use thermal cameras to check for water problems behind drywall or other concealed spaces. That way, we can decide whether to drill holes, teardown the area or use other techniques learned through ASD, Applied Structural Drying, training. Removing the moisture left on materials after extracting standing water is essential. Doing such removal at the right speed is also crucial to avoid other problems. For example, drying wood too fast can lead to cracking while a low drying rate can allow mold to grow. Our SERVPRO technicians use moisture meters and thermo-hygrometers to monitor the drying process allowing us to use the right number of air movers and dehumidifiers. Monitoring also helps determine when to move the equipment to balance the process. You should not worry when there is a water spill in your property. Call SERVPRO of Irwindale / Baldwin Park to assist. You can reach us at (626) 337-3374 any time. Click here for more about Irwindale. Don't attempt to clean any mold that you find in your home. You may only spread the infestation further. Call SERVPRO to investigate. While many Irwindale homeowners might be familiar with mold and the kind of damage that it can do to a property, they do not fully understand the process required to remove that threat from their homes. As many might have already seen on the Internet, there are many “mold removal” strategies that guarantee the removal of all mold in your home with simple solvents and detergents, but these are inaccurate. In truth, mold exists naturally in nearly every environment, so removing it entirely is not just improbable, it is impossible. Our approach to mold damage in your Irwindale home is a process called remediation. This system targets the colonization and spread of mold throughout your home and removes these colonies that form. While microscopic spores on their own do not damage your house and threaten the health of its occupants, when moist conditions allow for these spores to seat into materials, the colonies can prove hazardous to the structure. The initial steps of remediation from our SERVPRO professionals centers on containment. By removing the ability of mold colonies to spread farther throughout your home, we can work quickly on existing organisms and remove them. While remediation does often require material removal, especially on porous surfaces like drywall, our team also features licensed contractors to help make this reconstruction process seamless, time-saving, and cost-effective. Remediation is not the same as mold removal, but it can help you to recover your damaged property once mold colonization has occurred. 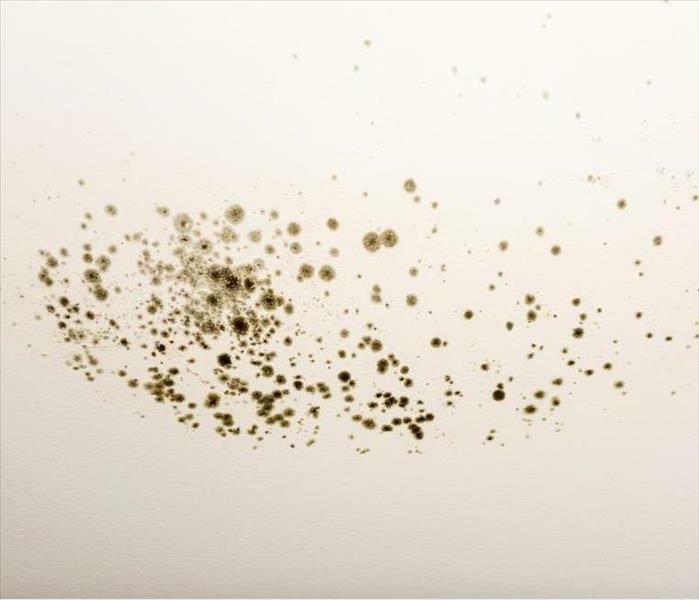 You can count on our experienced SERVPRO of Irwindale / Baldwin Park mold remediation specialists to arrive quickly, 24/7, by calling (626) 337-3374. Click here for more information about Irwindale. SERVPRO Franchise professionals can help minimize your down time after water damages your business. Food stores offer customers throughout the Vincent area ingredients, snacks, meals, and all manner of appetite sating items. While you might expect many customers from the time you open through the time you close, natural disasters like flooding can force you to close your doors to these customers until the restoration of your building completes. 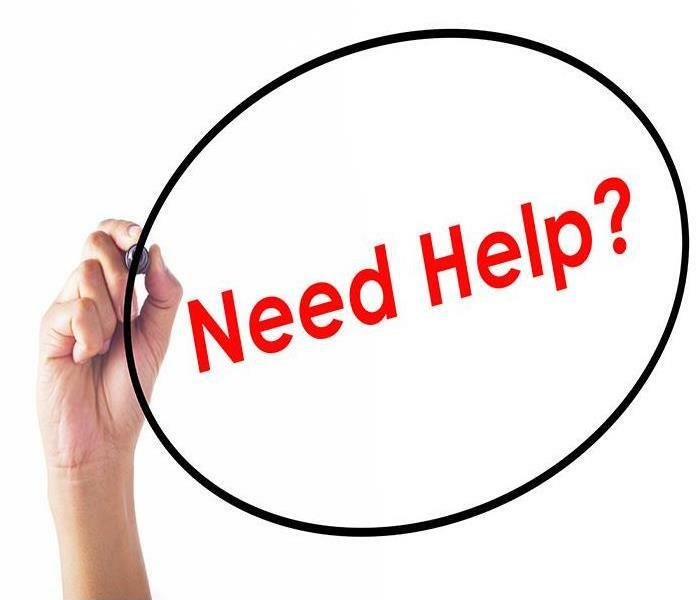 With so many depending on your business to be open, it is critical to work fast to get the right professionals to your store with the ability to help you recover the damage quickly. Flood removal for the damage and higher volumes of water that affects your Vincent food store might seem unnecessary; this is not the case. Our SERVPRO Franchise professionals have the training and expertise to determine the full scope of the damage quickly so that you are not only partially cleaning and drying up damage. Leaving moisture and dampness from flooding results in mold growth, and this can result in health effects for any humans or pets exposed to an active colony. One of the primary concerns that a food store owner should have is the stock in the building. 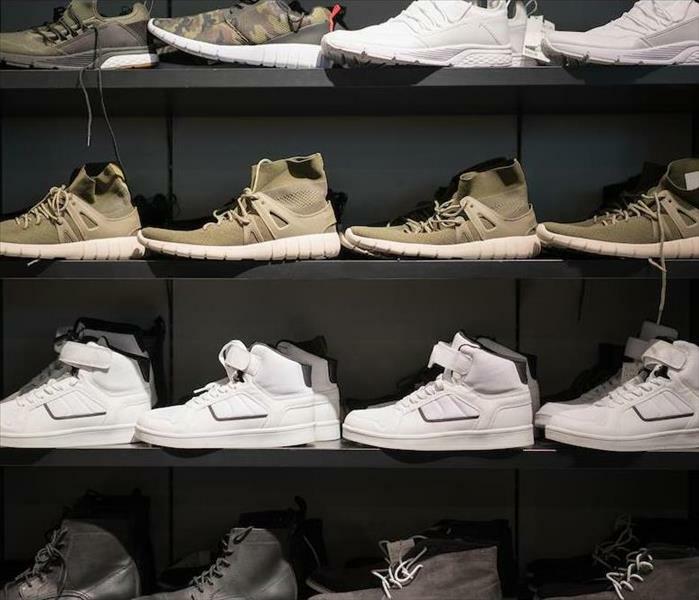 Investments get made into every item that ends up on the shelves and other areas of the store, meaning that prolonged flood damages can adversely affect these items. The items do not even need to fully come into contact with the water to become exposed to moisture and dampness that could render it ruined. The SERVPRO Franchise Professionals dispatched to the store arrive with our advanced equipment that can quickly extract excess water from the damaged areas of the store. Once this pooling water has gotten removed, our team can focus their efforts on trying to locate the ideal locations to begin setting up our efficient drying tools like air movers, dehumidifiers, and similar equipment. 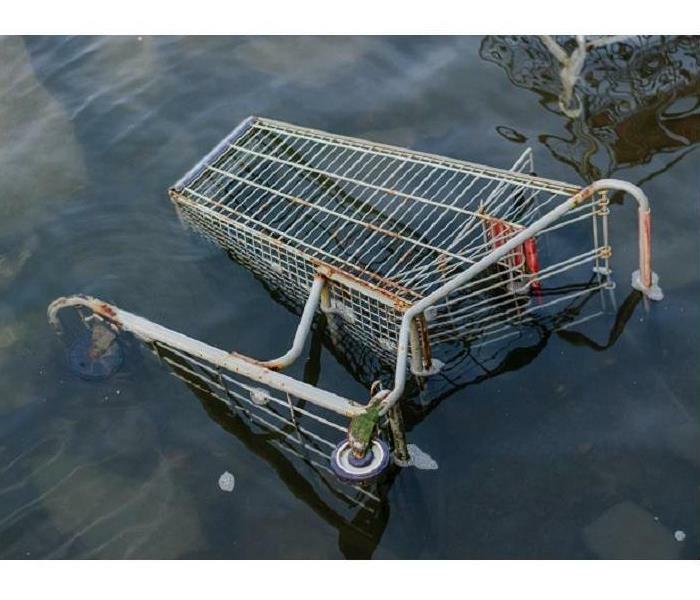 While there are undoubtedly some concerns when your food store gets flooded unexpectedly, one of the first of these is staying safe and protecting your investment in your store. Give our SERVPRO of Irwindale / Baldwin Park team a call immediately to help begin mitigating your loss following a flood at (626) 337-3374. 4/7/2019 - When is the Right Time to Start Water Removal in Your Baldwin Park Home? 3/11/2019 - Are You Making These Types of Commercial Flood Damage Remediation Mistakes in Baldwin Park? 2/21/2019 - Don't Panic After A Water Damage Disaster In Your Irwindale Home, Call Our Experts At SERVPRO!